William Kentridge is not interested in painting a perfect bowl of fruit. He also doesn’t seem much interested in fitting into any of the conventional definitions of artist. He’s a sculptor and a painter. He creates extraordinary animations using charcoal, ink and a process he describes as “stone-age” stop-motion. (The New Yorker’s art critic Calvin Tomkins: “I still can’t figure out why these stubbornly low-tech films are so moving.”) His sketches attract crowds in art galleries and transform stages in opera theatres. He works in film, sound and tapestry. He’s a performance artist. Now in his early 60s, the South African artist (a noun that seems reductive, once you list his range of work) is one of the major creative forces in the 21st century art world. A production image from the Salzburg Festival's 2017 production of Wozzeck. Photo by Ruth Walz. In 2019, Opera Australia (with the Metropolitan Opera of New York, Canadian Opera Company and the Salzburg Festival) presents his arresting production of Berg’s fascinating opera Wozzeck. It’s a showcase for Kentridge’s powerful animations, which cast a dark light on Berg’s disturbing story. But don’t expect an exhibition. 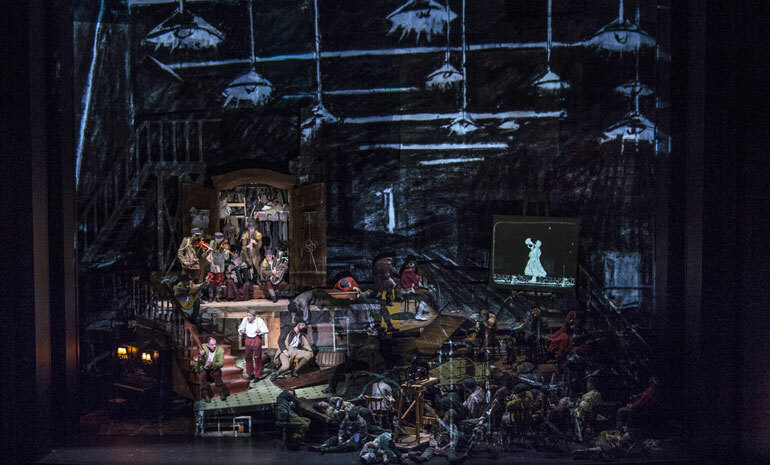 Kentridge has created a vivid, thoughtful production of an important 20th century work. The Financial Times described it as “a breathtaking reassessment of Berg’s masterpiece… a work of art across many genres”. Reassessments of opera usually send critics running for the exits, but each of the respected critics that published a review seemed enthralled. The New York Times said the audience “seemed stunned at the end, yet grateful.” The Telegraph gave it five stars: “a stupendous, faith-restoring production”. 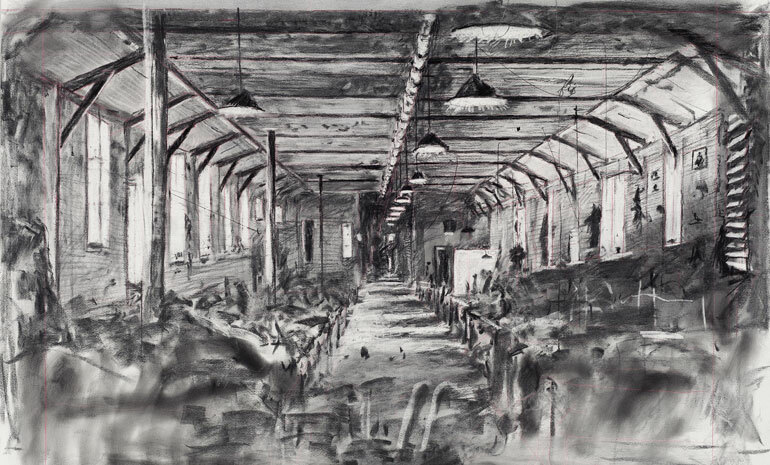 One of William Kentridge's sketches for Wozzeck, 2016/2017. Kentridge is interested in the alchemy of art: how the artist can transform any number of materials into meaningful works of art. He lived through the absurd horrors of apartheid and did so with a keen awareness of how his white, Jewish heritage informed his place in a broken society. His work is concerned with memory, ideology and history. Art is a place where those ideas can intersect. His creations are often absurd, sometimes impersonal, and strangely compelling. His drawings have a “rough magic that’s unlike anything else in contemporary art,” Tomkins wrote for The New Yorker in 2010. You can discover Kentridge and his work in Sydney in various ways this summer. Wozzeck is on at the Joan Sutherland Theatre, Sydney Opera House. Hear William Kentridge in conversation with Opera Australia’s Artistic Director, Lyndon Terracini, on the set of Wozzeck in the Joan Sutherland Theatre at Sydney Opera House.